How should the world look after the global financial and economic crisis? A special high-level panel will discuss the world post the global economic crisis on Friday, October 2, in Istanbul during the Annual Meetings. The panel will feature Robert B. Zoellick, Bank Group President; H. E. Sri Mulyani Indrawati, Minister of Finance, Indonesia; H.E. Mahmoud Mohieldin, Minister of Investment, Egypt; Ms. Eleni Gabre-Madhin, CEO, Ethiopian Commodity Exchange; and Professor Paul Collier, Department of Economics, University of Oxford. The debate will be recorded on Friday, October 2, and will be broadcast over the next two days on France 24. The panel is taking questions from people from around the world. If you have any questions for the panelists, you can ask them directly through Speak Out, our online chat, and we will pass them on. BBC World yesterday hosted a debate at World Bank headquarters in Washingtonon on how the world's poorest are being affected by the global economic downturn and what can be done to avert a major international human disaster. While the rich world pours billions of dollars into banks and companies, why can’t it spare more for the poorest nations now suffering the effects of the downturn, asked BBC Host Zeinab Badawi. The five-person panel–including World Bank President Robert Zoellick, German Development Minister Heidemarie Wieczorek-Zeul, Mozambique Prime Minister Luisa Dias Diogo, Indian economic planner Montek Singh Ahluwalia, and activist Bob Geldof—agreed that a solution to the crisis can’t be business as usual and needs to come now. Unlike the tsunami of 2004, the victims of the financial crisis aren’t so easy to visualize, said Wieczorek-Zeul, making it harder for governments to commit aid money. But there are victims. An estimated 200,000 to 400,000 children will die annually as a result of the crisis, she noted. Zoellick stressed that for those in the developing world, the crisis isn’t a matter of losing your financial cushion—it’s a matter of eating, of going to school. And the impact won’t end when the crisis ends; it will be felt over a generation. Responding to the crisis with economic isolationism and protectionism will only hurt everyone, especially the world’s poorest, Zoellick added. Prime Minister Diogo warned that if we don’t act, there is a potential for instability. 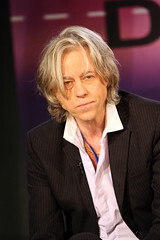 “Instability increases nervousness… poverty increases conflict,” said Geldof. A number of panelists noted that the G20 meeting in London last month was the beginning of the basis for a new global architecture. “We all agree that a global problem requires a global solution with global ownership,” said Ahluwalia. 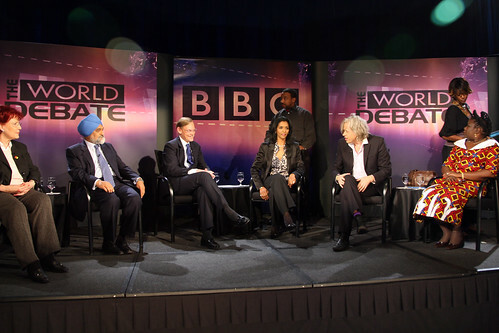 The debate airs on BBC World on Saturday, April 25.